Think of geometry as a mini art lesson. The key to doing well on geometry problems is this: Draw and label a diagram for every geometry problem that you face. Include every measurement that you know on the diagram, and use a variable to label anything you’re looking for. After you get a nice little illustration on paper, you’re ready to rumble through the problem. Without that drawing, you’re primed for a fall, so even if you think a problem is incredibly easy, draw a quick diagram anyway. Beauty isn’t what counts; getting the right answer is. 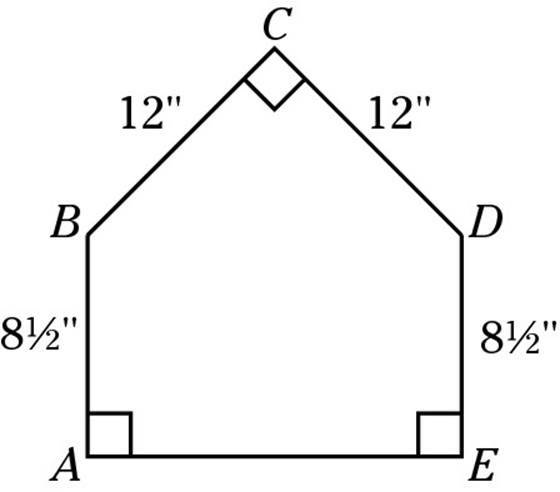 Angles are a big part of the SAT geometry problems, so pay attention to this section. Finding an angle is usually a matter of simple addition or subtraction, provided you remember the key facts I cover here. There are no negative angles. There are no zero angles. Fractional angles rarely appear on the test. For example, an angle is unlikely to measure 451⁄2 degrees or 323⁄4 degrees. 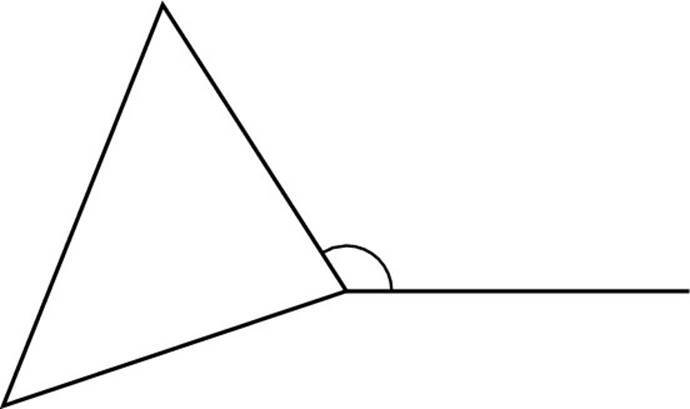 Angles that equal 90 degrees are called right angles. They’re formed by perpendicular lines and are indicated by a box in the corner of the two intersecting lines. If you don’t see one of these three “disclaimers,” you may be headed for a trap! 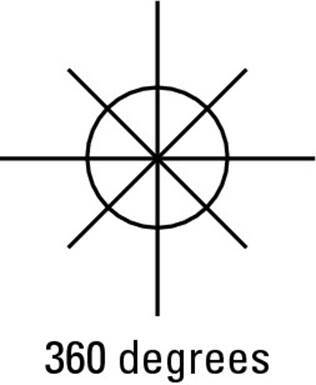 The sum of the angles around a point is 360 degrees. Think of the angles as forming a complete circle around a center point. Angles that are opposite each other are congruent (they have equal measures) and are called vertical angles. 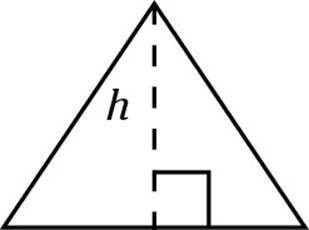 Note that vertical angles may actually be horizontal. Just remember that vertical angles are across from each other, whether they’re up and down (vertical) or side by side (horizontal). 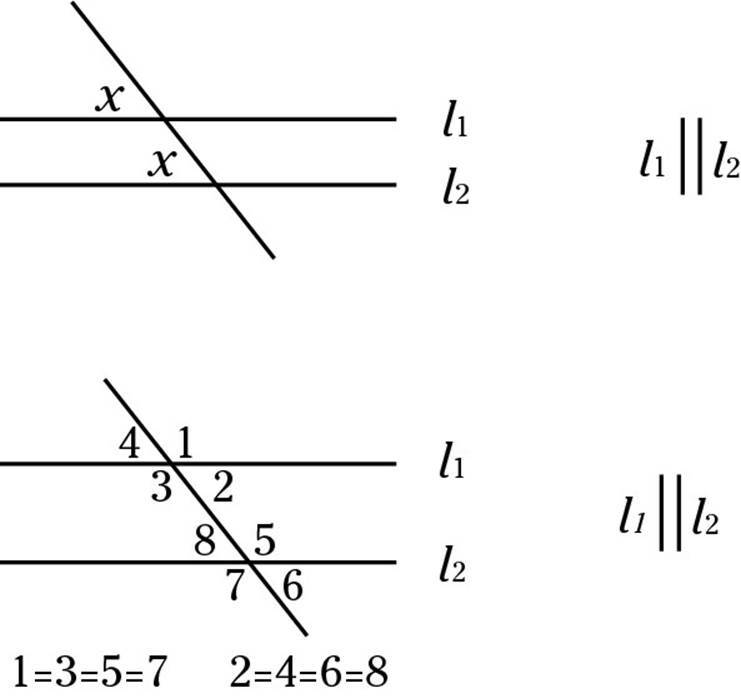 Angles in the same position — called corresponding angles — around two parallel lines and a transversal have the same measures. When you see two parallel lines and a transversal (a line that crosses them), number the angles. Start in the upper-right corner with 1 and go clockwise. For the second batch of angles, start again in the upper-right corner with 5 and proceed clockwise. The numbers will help you keep track of the angles. Note that all the odd-numbered angles are congruent and all the even-numbered angles are congruent, as long as the question and/or diagram tells you that the lines are parallel. If you zig when you should’ve zagged, you can no longer use the tip that all even-­numbered angles equal one another and all odd-numbered angles equal one another. The exterior angles of any figure are supplementary to the interior angles and sum up to 360 degrees. 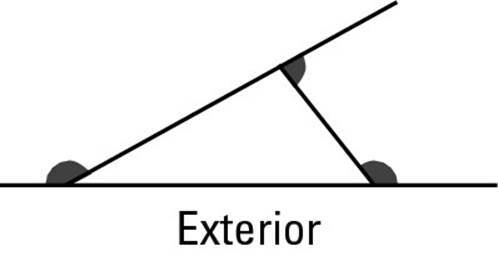 Exterior angles can be very confusing; keep in mind that they always sum up to 360 degrees, no matter what type of figure you have. A fair number of math problems you face when you take the SAT deal with polygons — ­figures with three or more noncurved sides. Triangles take a star role on the test, but ­quadrilaterals (four-sided shapes) also appear fairly regularly, and a more exotic figure (a pentagon or a hexagon, perhaps) may show up, too. Never fear: This section prepares you for all sorts of polygon questions that may appear on the SAT. 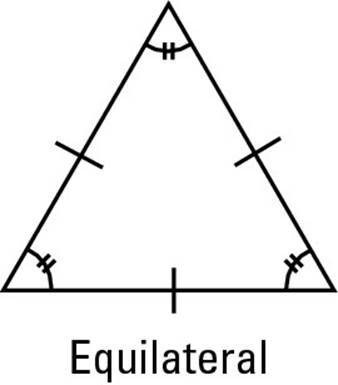 A triangle with three equal sides and three equal angles is called equilateral. A triangle with two equal sides and two equal angles is called isosceles. Angles opposite equal sides in an isosceles triangle are also equal. 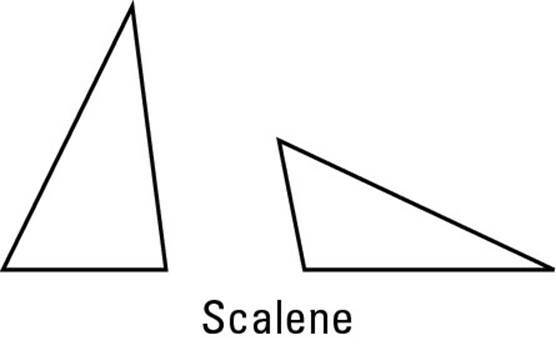 A triangle with no equal sides and no equal angles is called scalene. 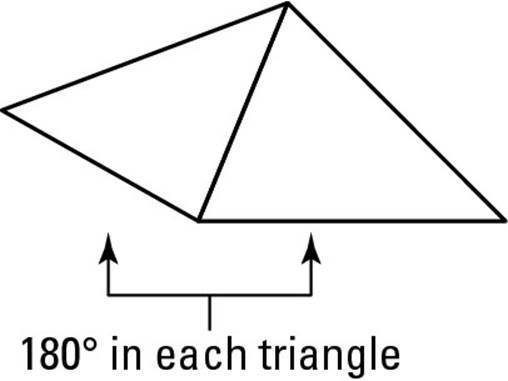 In any triangle, the largest angle is opposite the longest side. Similarly, the smallest angle is opposite the shortest side, and the medium angle is opposite the medium-length side. 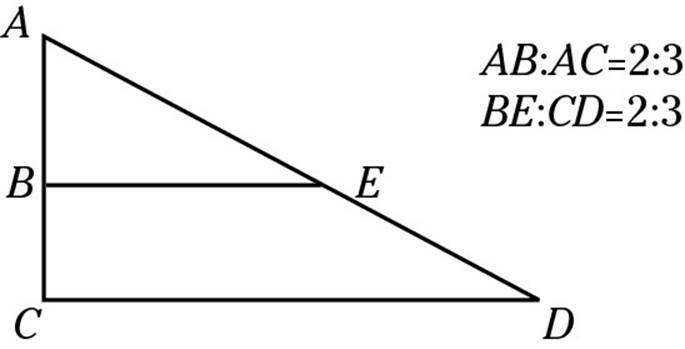 In any triangle, the sum of the lengths of two sides must be greater than the length of the third side (an idea often written as a + b > c, where a, b, and c are the sides of the triangle). In any type of triangle, the sum of the interior angles is 180 degrees. The measure of an exterior angle of a triangle is equal to the sum of the two remote interior angles. When you think about this rule logically, it makes sense. The sum of supplementary angles is 180 degrees. The sum of the angles in a triangle is 180. Therefore, angle x = 180 – (y + z) or angle x = 180 – a. Thus, a = y + z. The sides of similar figures are in proportion. For example, if the heights of two similar triangles are in a ratio of 2:3, then the bases of those triangles are in a ratio of 2:3, as well. 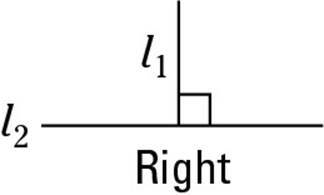 The ratio of the areas of similar figures is equal to the square of the ratio of their sides. For example, if each side of Figure A is 1⁄3 the length of each side of similar Figure B, then the area of Figure A is 1⁄9 — which is (1⁄3)2 — the area of Figure B. Time to apply the rules to the test. Take a crack at the following example to see whether you’ve been paying attention. The answer is (C). The ratio of the sides is 5⁄25 = 1⁄5. The ratio of the areas is the square of the ratio of the sides: 1⁄5 × 1⁄5 = 1⁄25. Note that (E) is a trap for the unwary. You can’t figure out the exact area of either figure because you don’t know the height (the area of a triangle is 1⁄2 base× height). However, I didn’t ask you for an area, only for the ratio of the areas, which you can find. Tired yet? I hope not, because you can travel this logical road a bit farther: What do you suppose is the ratio of the volumes of two similar figures? Because you find volume in cubic units, the ratio of the volumes of two similar figures is the cube of the ratio of their sides. If Solid A has a base of 5 and similar Solid B has a base of 10, then the ratio of their volumes is 1:8 — (1⁄2)3, which is 1⁄2 × 1⁄2 × 1⁄2 = 1⁄8. 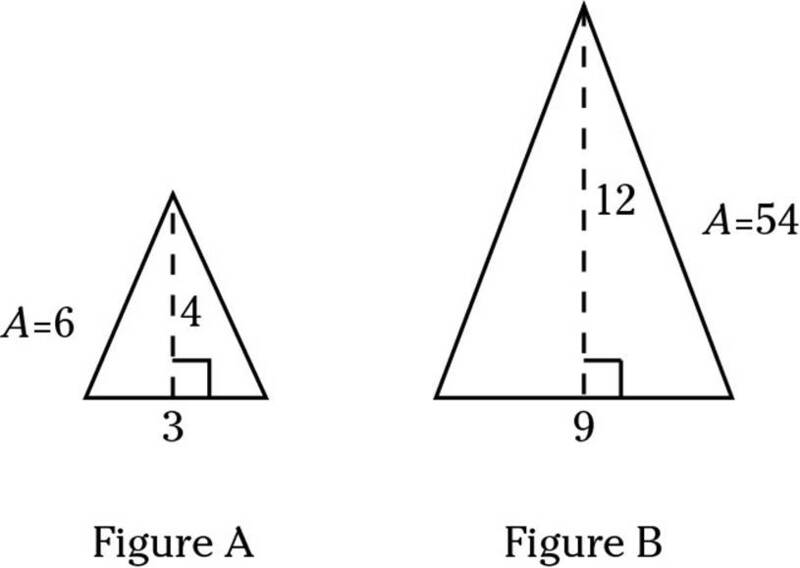 Don’t assume that any figures on the SAT are similar; either the problem must tell you they’re similar, or (if they’re triangles), they must have the exact same angles. You have probably studied the Pythagorean Theorem (known colloquially as PT) at some point in your math career. The theorem says that in any right triangle, you can find the lengths of the sides using the PT formula: a2 + b2 = c2, where a and b are the legs of the triangle and c is the hypotenuse. The hypotenuse is always opposite the 90-degree angle and is always the longest side of the triangle. Keep in mind that the Pythagorean Theorem works only on right triangles. If a triangle doesn’t have a right or 90-degree angle, you can’t use it. Ratio 3:4:5. 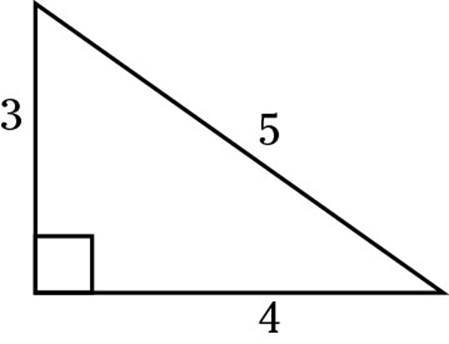 In this ratio, if one leg of the triangle is 3, the other leg is 4, and the ­hypotenuse is 5. Because this is a ratio, the sides can be in any multiple of these numbers, such as 6:8:10 (two times 3:4:5), 9:12:15 (three times 3:4:5), 27:36:45 (nine times 3:4:5), and so on. Ratio 5:12:13. 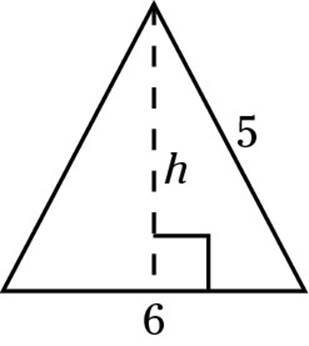 In this ratio, if one leg of the triangle is 5, the other leg is 12, and the hypotenuse is 13. Because this is a ratio, the sides can be in any multiple of these numbers, such as 10:24:26 (two times 5:12:13), 15:36:39 (three times 5:12:13), 50:120:130 (ten times 5:12:13), and so on. , where s stands for the side of the figure. Because two sides are congruent, this formula applies to an isosceles right triangle, also known as a 45-45-90 triangle. If one side is 2, then the other leg is also 2, and the hypotenuse is . This formula is great to know for squares. If a question tells you that the side of a square is 5 and wants to know the diagonal of the square, you know immediately that it is . Why? 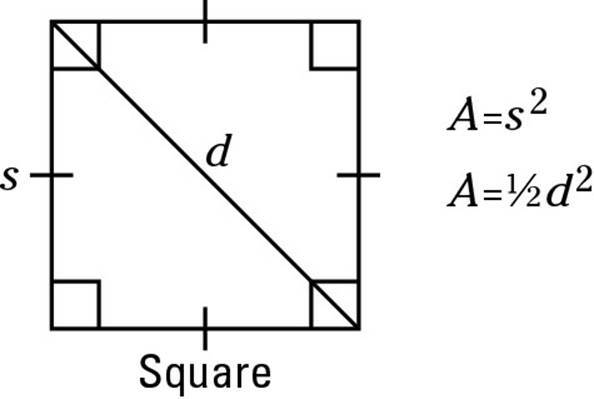 A square’s diagonal cuts the square into two isosceles right triangles (isosceles because all sides of the square are equal; right because all angles in a square are right angles). What is the diagonal of a square with sides of 64? . What is the diagonal of a square with sides of 12,984? .
. 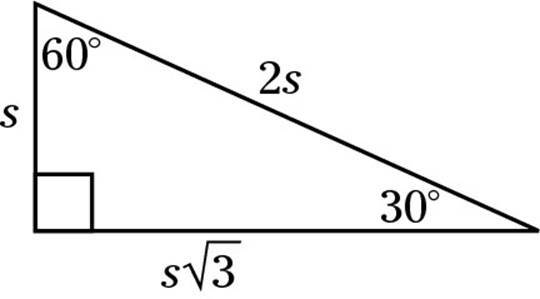 This ratio is a special formula for the sides of a 30-60-90 triangle. 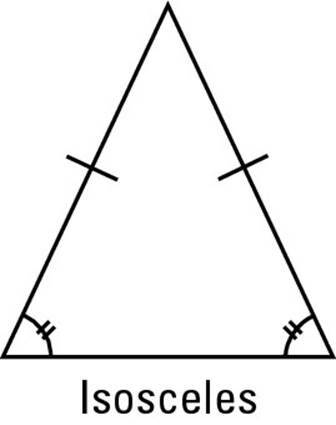 Two 30-60-90 triangles are formed whenever an equilateral triangle is cut in half. If an SAT question mentions the altitude of an equilateral triangle, you almost always have to use a 30-60-90 triangle to solve it. The answer is (D). Look at the 30-60-90 triangle formed by ACD. 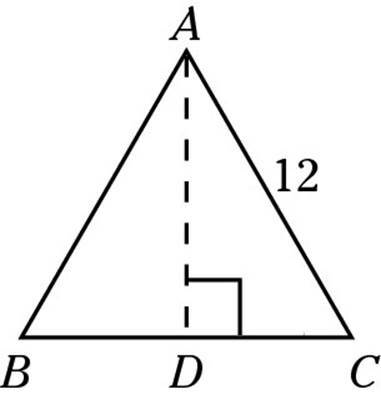 The hypotenuse is 12, the original side of the equilateral triangle. The base is 6 because it’s half the hypotenuse. That makes the altitude , according to the ratio. Remember that the 45-45-90 and 30-60-90 triangle patterns are included in the formula box at the beginning of each math section, in case you forget them. Don’t hesitate to look back at the direction text as you move through the math sections. Any four-sided figure is called a quadrilateral. The sum of the interior angles of any quadrilateral equals 360 degrees. Any quadrilateral can be cut into two 180-degree ­triangles. A square is a quadrilateral with four equal sides and four right angles. The area of a square is: side2. A rhombus is a quadrilateral with four equal sides and four angles that aren’t necessarily right angles. A rhombus looks like a square that’s slipping sideways. 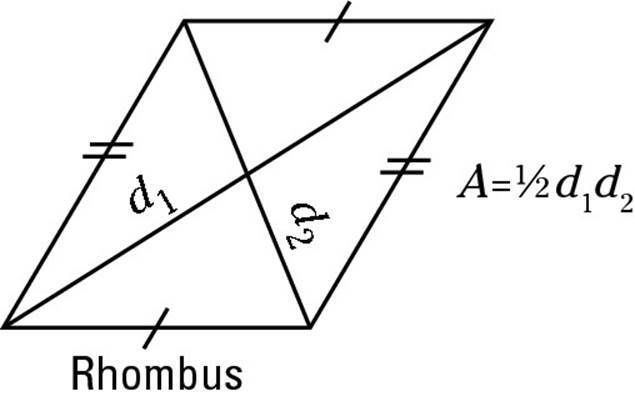 The area of a rhombus is: 1⁄2d1d2 (1⁄2 diagonal1 × diagonal2). A rectangle is a quadrilateral with four equal angles, all of which are right angles. The top and bottom sides are equal, and the right and left sides are equal. All angles in a rectangle are right angles. 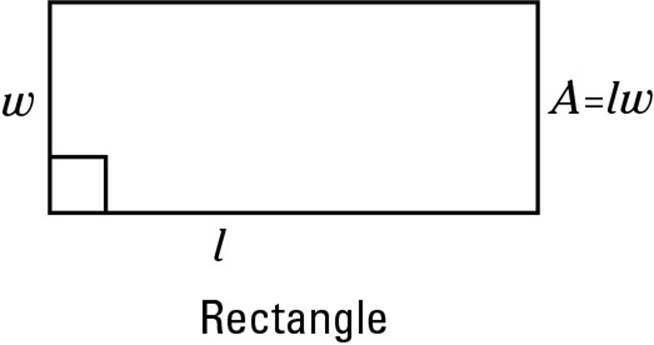 (The word rectangle means “right angle.”) The area of a rectangle is length ×width (which is the same as base × height). A trapezoid is a quadrilateral with two parallel sides and two nonparallel sides. 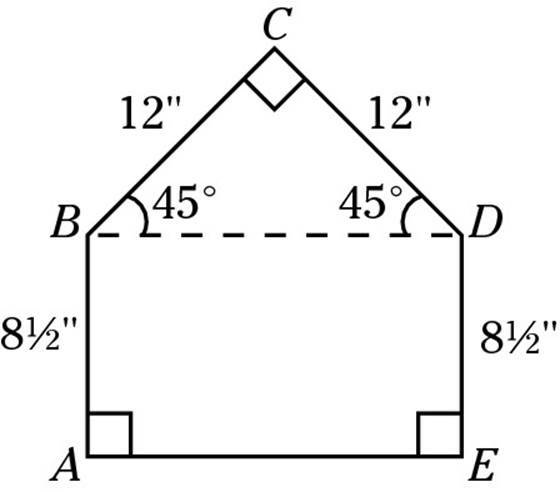 The area of a trapezoid is: 1⁄2 (base1 + base2) × height. It makes no difference which base you label base1 and which one you label base2 because you’re adding them together anyway. Just be sure to add them before you multiply by 1⁄2. Triangles and quadrilaterals are the most common polygons tested on the SAT; however, they’re certainly not the only ones out there. Table 16-1 notes a few other polygons you may see on the test. A polygon with all equal sides and all equal angles is called regular. For example, an equilateral triangle is a regular triangle, and a square is a regular quadrilateral. 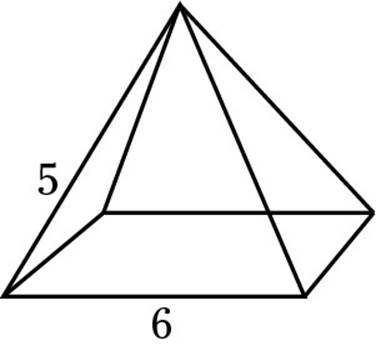 The SAT writers won’t ask you to find the area of any of these polygons, but they may ask you to find the perimeter, which is just the sum of the lengths of all the sides. They may also ask you to find the exterior angle measure, which is always 360 degrees. 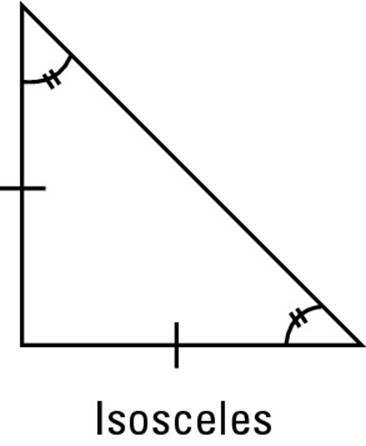 If they ask you about other angles, divide the shape up into triangles, as I do in the following figure. Then try your hand at the sample question that follows the illustration. The answer is (D). The key to solving this problem is in shape BCD, which is an isosceles right triangle. As you know, an isosceles right triangle is a 45-45-90 triangle, which has the ratio . Therefore, the hypotenuse, or BD, must be , which multiplies out to 16.97, or 17. Because ABDE is a rectangle, AE has the same length. Sometimes you have to use several different shapes to solve a problem, especially when the SAT throws a strange diagram at you and asks you to find the area of a shaded section, a very popular question (popular with the test makers, not with the test takers). 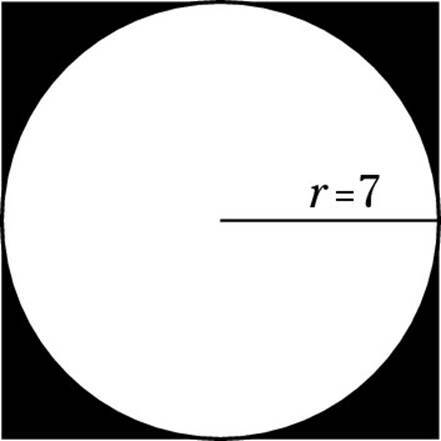 In the following diagram, a circle of radius 7 is surrounded by a square. How would you find the area of the shaded section? In any problem like this one, the shaded area is equal to the area of the larger shape minus the area of the smaller shape — in this case, the area of the square minus the area of the circle. Because the circle has a radius of 7, its diameter is 14, which must be the same as the side of the square. The area of the square, then, equals 14 × 14 = 196. 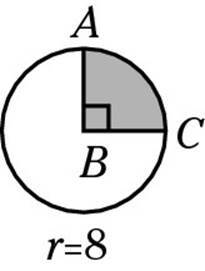 You can find the circle’s area using the formula πr2 = π(7)2 = 49π. The shaded area, then, equals 196 – 49π, or 42.06, if you’re using decimals. 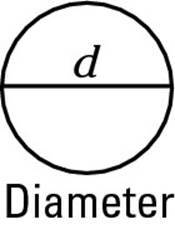 A diameter (d) connects two points on the outside or edge of the circle, going through the center. 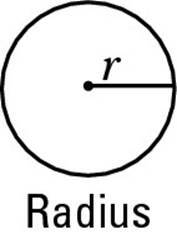 A diameter is equal to two radii. The perimeter of a circle is called the circumference. The formula for circumference is 2πr or πd (logical because 2 radii = 1 diameter). A chord connects any two points on a circle. The longest chord in a circle is the ­diameter. A tangent is a line that touches the circle at exactly one point. 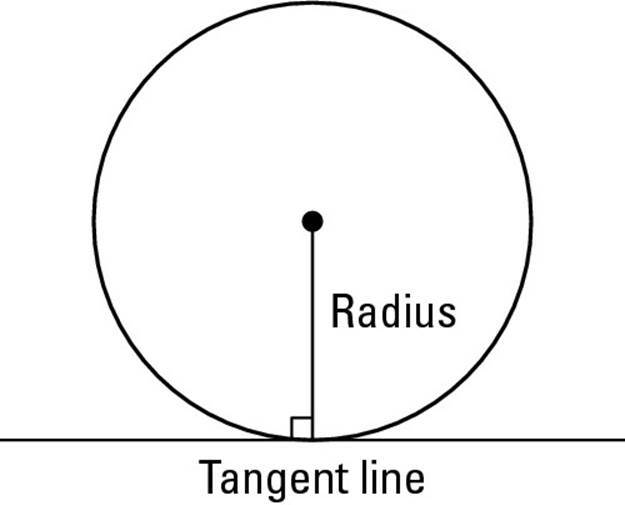 When a tangent line meets a radius of the circle, a 90-degree angle is formed. 1. Find the circumference of the entire circle. 2. Put the degree measure of the arc over 360 and reduce the fraction. 3. Multiply the circumference by the fraction. 1. Find the area of the entire circle. 2. Put the degree measure of the sector over 360 and reduce the fraction. 3. Multiply the area by the fraction. Finding the area of a sector is very similar to finding the length of an arc. The only difference is in the first step. 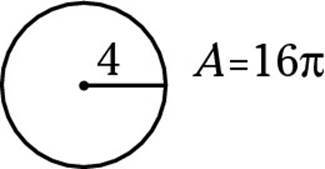 Whereas an arc is a part of the circle’s circumference, a sector is a part of the circle’s area. Now that all these rules are circling in your head (pun intended! ), try your hand at a few example problems. A child’s wagon has a wheel of radius 6 inches. If the wagon wheel travels 100 revolutions, approximately how many feet has the wagon rolled? The answer is (B). One revolution is equal to one circumference: C = 2πr = 2π(6) = 12π = approximately 37.68 inches. Multiply that by 100 = 3,768 inches, and 3,768 inches ÷ 12 = 314 feet. Find the length of arc AC. The answer is (E). Take the steps one at a time. First, find the circumference of the entire circle: C= 2πr = 36π. Don’t multiply π out; problems usually leave it in that form. Next, put the degree measure of the arc over 360. 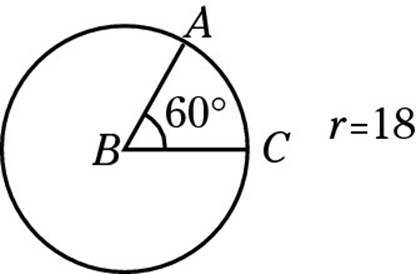 The degree measure of the arc is the same as its central angle, 60° = 60⁄360 = 1⁄6. 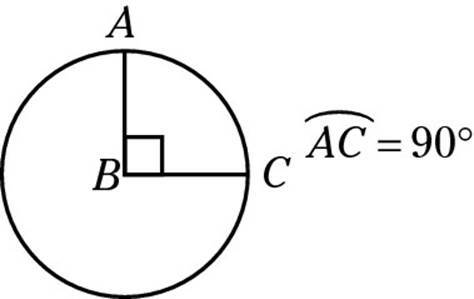 The arc is 1⁄6 of the circumference of the circle. Multiply the circumference by the fraction: 36π × 1⁄6 = 6π. Be very careful not to confuse the degree measure of the arc with the length of the arc. The length is always a portion of the circumference, always has a π in it, and always is in linear units. If you chose (D) in this example, you found the degree measure of the arc rather than its length. What’s the area of the shaded sector? The answer is (B). To do this problem, first, find the area of the entire circle: A = πr2 = 64π. Second, put the degree measure of the sector over 360. The sector is 90 degrees, the same as its central angle. 90⁄360 = 1⁄4. Third, multiply the area by the fraction: 64π × 1⁄4 = 16π. From time to time, the SAT writers like to make an effort to include “real-world math” on the test. Now, if it were really about the real world, you’d see questions like “If a student wakes up 20 minutes before school begins and it takes him 10 minutes to run there at top speed, how many students are going to want to sit near him in class?” But where was I? Now I remember. The real world is three-dimensional (3-D). To reflect that simple fact, almost every SAT has a problem or two dealing with a box, a cylinder, or (rarely) some other three-dimensional shape. The key formulas you need to know regarding these 3-D ­figures are included in the direction text at the start of each math section, but I also offer you a quick review here. A cube is a 3-D square. Think of a die (one of a pair of dice). All a cube’s dimensions are the same; that is, length = width = height. 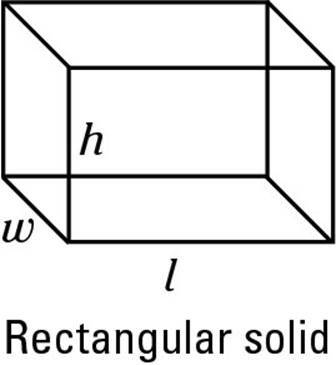 In a cube, these dimensions are called edges, or sides. 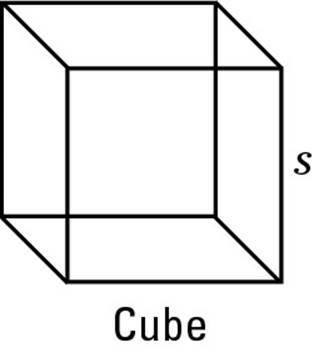 The volume of a cube is side × side × side = side3 = s3. A rectangular solid is a box. The base of a box is a rectangle, which has an area of length × width. Multiply that area by height to fit the original volume formula: Volume = area of base × height, or V = l · w · h.
Think of a cylinder as a can of soup. 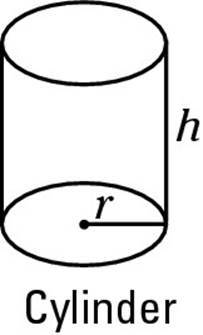 The base of a cylinder is a circle. The area of a circle is πr2. Multiply that number by the height of the cylinder to get this formula: area of base × height = πr2 · height. Note that the top and bottom of a cylinder are identical circles. If you know the radius of either the top base or the bottom base, you can find the area of the circle. The dashed line is the height, which makes a right angle with the base and cuts it in half. Thus, you have a right triangle with a leg of length 3 and a hypotenuse of 5. Does that sound familiar? Of course: It’s a 3-4-5 triangle! 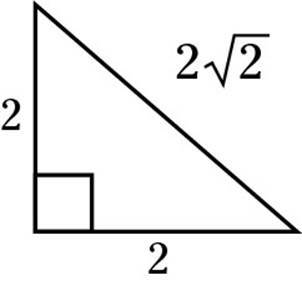 So the height is 4, making the area of one triangle 1⁄2 × 6 × 4 = 12. And because there are four such triangles, their total area is 4 × 12 = 48, which you can now add to the 36 from the base to get Choice (C), or 84. I don’t know about you, but I think I deserve a nap after that problem!